I made this cute little train earlier this year. It’s meant to represent a cheesy fake train that you might find at an amusement park to ferry passengers between the parking lot and the rides. It features three cars and an 0-4-0 locomotive, built on the 9V train motor base. The cars use the smaller diameter wheels so that they can be low to the ground. This amusement park ride is known in various parts of the world as the Scrambler, Twist, Twister, Cyclone, Sizzler, Merry Mixer, Grasscutter, or Cha Cha. In my part of the world (California) I’ve always seen it called the Scrambler. Wikipedia has more information about this ride under its various guises. 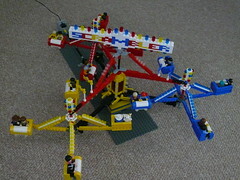 I built this model for the 2009 Bay Area Maker Faire where it was a part of BayLUG‘s largest ever public exhibit. The operating mechanism is similar to the real thing – a central axle drives the whole mechanism, and rubber tires attached to each arm’s driveshaft transfer that motion to the ends of each of the three main arms, where a 90 degree gear causes the 4 cars to spin around. See all the photos and a video on flickr (slide show).